The Complete Monty Python's Flying Circus 16-Ton Megaset packs together the original 14-DVD megaset with the two-disc Monty Python Live in space-saving Thinpaks. 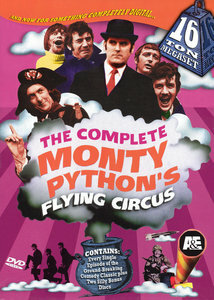 While more cautious fans may want to pick and choose among the previously released individual volumes of Monty Python for their collection, true Pythonites will want to own this definitive megaset that contains all 45 episodes (in chronological order) of Monty Python's Flying Circus. This "persistently silly" collection encompasses three-and-a-half seasons of dead parrots, cross-dressing lumberjacks, loonies, upper class twits, and spam, spam, spam, spam, spam, spam, spam, baked beans, spam, spam, and spam. King Arthur and his knights embark on a low-budget search for the Grail, encountering many, very silly obstacles. 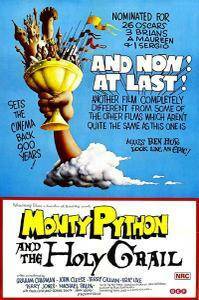 From its opening multi-language titles (that sure looks like Swedish) to the closing arrest of the entire Dark Ages cast by modern-day bobbies, Monty Python and the Holy Grail helped to define "irreverence" and became an instant cult classic. This time the Pythonites savage the legend of King Arthur, juxtaposing some excellently selected exterior locations with an unending stream of anachronistic one-liners, non sequiturs, and slapstick set pieces. The Knights of the Round Table set off in search of the Holy Grail on foot, as their lackeys make clippety-clop sounds with coconut shells. A plague-ridden community, ringing with the cry of "bring out your dead," offers its hale and hearty citizens to the body piles. A wedding of convenience is attacked by Arthur's minions while the pasty-faced groom continually attempts to burst into song. The good guys are nearly thwarted by the dreaded, tree-shaped "Knights Who Say Ni!" A feisty enemy warrior, bloodily shorn of his arms and legs in the thick of battle, threatens to bite off his opponent's kneecap. 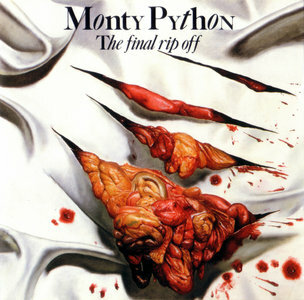 This is it the one Monty Python album that you must have. A compilation drawn from various films, TV series, and performance sketches, The Final Rip Off consists of two CDs of absolute classics. 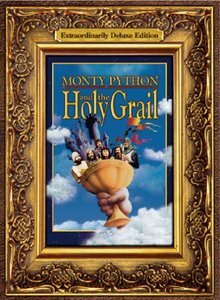 One of the very first tracks is the famous "Constitutional Peasant" scene from Monty Python and the Holy Grail. Also included are "Spanish Inquisition," "Argument," "Lumberjack Song," and several other sketches that have achieved much-deserved pride of place in popular culture. The members of Monty Python are quite aware of this–the much-loved dead-parrot sketch is listed here as "Parrot (Oh, Not Again)." It's a testimony to the artistry, not to mention timing, of the group that the great majority of this stuff is still funny after decades of wear. 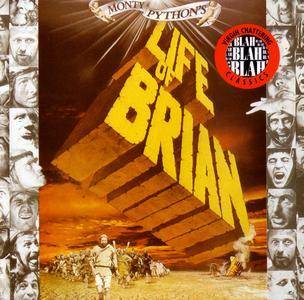 Soundtrack album for arguably the Python's best film (or at least their most controversial, talky, and profound). 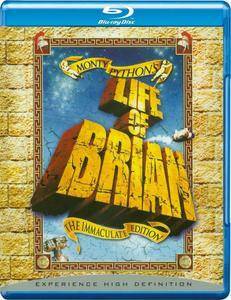 The group's take on the biblical epic focuses on Brian (Graham Chapman), mistaken for the messiah by a group of easily impressed locals. All the best bits from the movie are here, including the "Sermon on the Mount" (as misheard by "Mr. Big Nose"); the People's Liberation Front of Judea (or is it the Judean People's Liberation Front? ); Brian's impromptu preaching ("He's making it up as he goes along! "), and the concluding song, "Always Look on the Bright Side of Life," sung by the cast as they hang crucified. 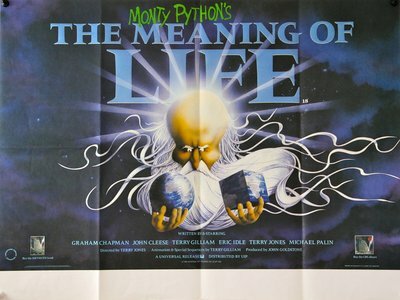 The album offers little apart from the clips from the film, except for some studio banter between a producer (Eric Idle) and a useless announcer (Graham Chapman). 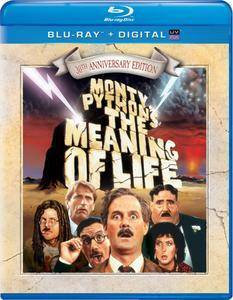 The Meaning of Life is without a doubt the most tasteless of the Monty Python feature films; it also happens to be one of the funniest. Life's questions are "answered" in a series of outrageous vignettes, beginning with a pre-credits sequence at a staid London insurance company which transforms before our eyes into a pirate ship. One of our favorite bits involve the National Health doctors who try to claim a healthy liver from a still-living donor, pointing out that there's nothing in his contract preventing this. And of course, there's the scene with the world's most voracious glutton, who brings the art of vomiting to new heights before his spectacular demise. Be warned: though hilarious, this may be the grossest bit of comedy filmmaking ever conceived (there aren't enough words in the world to describe it in detail!). 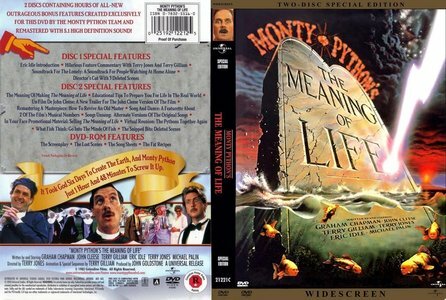 Loyal Pythonites Graham Chapman, John Cleese, Terry Gilliam, Eric Idle, Terry Jones and Michael Palin star in The Meaning of Life and share writing responsibilities, while Jones is in the director's chair this time out. The stages of life are told through multiple sketches and songs by the British comedy troupe. The seven parts of life cover birth, growing up, war, middle age, organ transplants, old age and death. Not all stages are singular: "Part I: The Miracle of Birth" is from the perspective of an ignored woman in labor, and of a Roman Catholic couple with too many children, and "Part VII: Death" encompasses a funeral and heaven. Added are three unrelated skits placed in the beginning, middle and end. A tribute special to the Monty Python comedy group, produced in 1989 and originally broadcast by the BBC on 5th October of that year (the 20th anniversary of the debut of the group's television series, Monty Python's Flying Circus). It was compiled by John Lloyd. It was hosted by Steve Martin, who introduced several sketches from Monty Python's Flying Circus, as well as some sketches from the German remake Monty Python's Fliegender Zirkus. 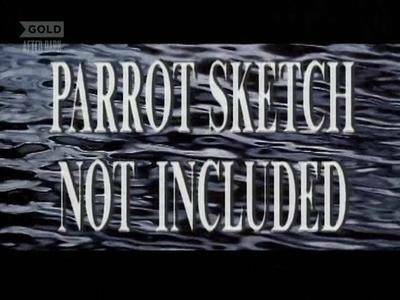 True to its title, the popular Dead Parrot sketch was not included. The story of Brian of Nazareth, born on the same day as Jesus of Nazareth, who takes a different path in life that leads to the same conclusion. Brian joins a political resistance movement aiming to get the Romans out of Judea. Brian scores a victory of sorts when he manages to paint political slogans on an entire wall in the city of Jerusalem. The movement is not very effective but somehow Brian becomes a prophet and gathers his own following. His fate is sealed however and he lives a very short life.